Models posing with the logo of Moet & Chandon, one of the prime sponsors of Ghana Fashion & Design Week. The second annual Ghana Fashion & Design Week kicks off today. After a successful launch last year, it is now one of Ghana's most anticipated fashion events of the year. Showcasing a host of designers from Africa as well as the African diaspora, the shows promise to present the best in style, creativity and represent what's in store for Africa's future in fashion. Familiar designers from last year returning include 1981, Sarah Duah and Jil Boutique. Some new labels join the lineup including House of Marie, Tuedor and Wright, Vonne Couture and Tap Designs. 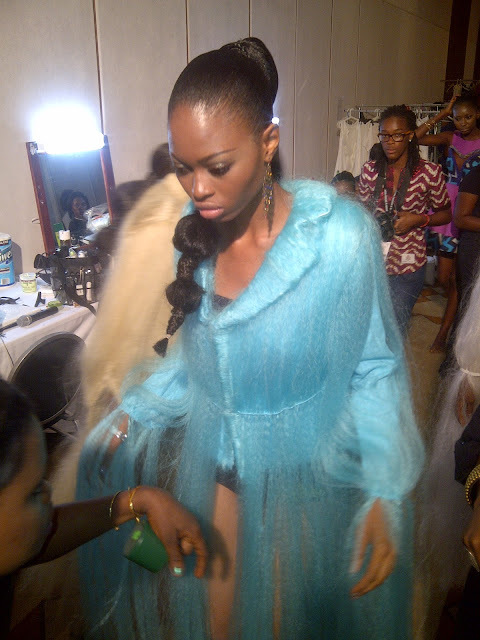 Model wearing Sarah Duah from her 2012 collection at Ghana Fashion & Design Week 2012. Sarah Duah from Germany who showed her first collection last year, continues to push the boundaries of creativity with her new collection. Last year everyone remembered her collection completely inspired by hair. It had attendees talking for weeks after the event. Hers was one of the most unique and memorable. She was recently touted as one to watch in Vogue UK and is known in the fashion circles as being quite avante-garde. Her collection this season is inspired by the idea that everyone carries their own personal package. It should be an interesting display. CLICK HERE TO SEE SARAH DUAH TALK ABOUT HER COLLECTION LAST YEAR. If there is any designer who pays homage to her Ghanaian roots it has to be Adoley Addo of Jil Boutique. She always uses African prints particularly the woven kente cloth in her work. Her ability to fuse it into a modern and contemporary design is what makes her work stand out. The use of kente in bold bright colours is a strong element throughout. House of Marie's use of colour and texture while still infusing the culture of Africa are what make this International label interesting. Joan Ibuzo is the head designer and she brings together a mix of culture with a modern appeal by using lace, tie-dye, chiffon and even leather into her collection. GFDW promises to stay true to its vision to provide a platform for Ethical Fashion under the name Ethika. Della La, Tash'Ornee, Fashion Rising Collection and Tuedor and Wright are all part of this initiative to promote sustainable and ethical fashion practices in Africa. One exciting addition this year is an opportunity for new fashion graduates to have this international platform of exposure to present their collections. The Emerging talent presentation will feature the work of up and coming designers who are part of the first group of graduates from Radford University's Fashion Design program. This is a representation and clear indicator of Ghana's future in the fashion business. As the school grows and fosters new talent it will only serve to drive more development in Ghana's fashion industry as well as further solidify Africa's stronghold in fashion.